Who was the first American in space? I’ll forgive you if you answer Alan B Shepard. He was the first American *human* in space, I’ll grant you, but three months before Shepard’s 15-minute sub-orbital flight, a pioneering young chimpanzee named Ham travelled into outer space aboard the Mercury-Redstone 2 (MR-2). Ham (an acronym of the lab he trained at and nothing to do with the stuff you put in sandwiches), was brought to Holloman Air Force Base in 1959 having been purchased by the United States Air Force. 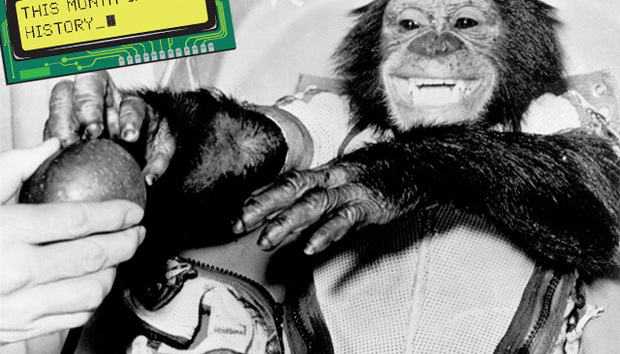 One of 40 space chimps, Ham, originally named No. 65, went through vigorous training at Cape Canaveral under neuroscientist Joseph V. Brady. Here, succeeding at simple timed tasks such as pushing a lever within five seconds of seeing a blue flashing light earned him a tasty banana pellet - or resulted in an electric shock to his feet if he failed. The mission was launched at 1655 GMT on January 31, 1961 and Ham’s vital signs and tasks were to be monitored throughout. However, there were problems almost immediately. The flight path was a degree off, Ham’s oxygen supply dropped – and the mission had to be aborted. Luckily, as the capsule plummeted downwards, Ham was protected by his spacesuit and performed important lever-pulling duties before his pod splashed into the Atlantic. This chimp had travelled 155 miles in 16.5 minutes. Yet the poor chap had to wait three hours before he was found by a rescue ship since that one degree flight path change meant he overshot his landing site. But found he was, and in the nick of time too, since the force of impact had punched two holes in the capsule and the MR-2 was sinking fast. In the end our intrepid chimp only suffered a bruised nose for his trouble… and was rewarded with an apple and half an orange for his courageous part in the space race. With his career as an astronaut over, Ham spent 17 years at the National Zoo in Washington DC, before retiring to a chimpanzee colony in North Carolina. He died, aged 25, in 1983, and is buried at the International Space Hall of Fame in New Mexico.